Data sets can be joined, filtered, and split to generate custom views that illustrate data insights. 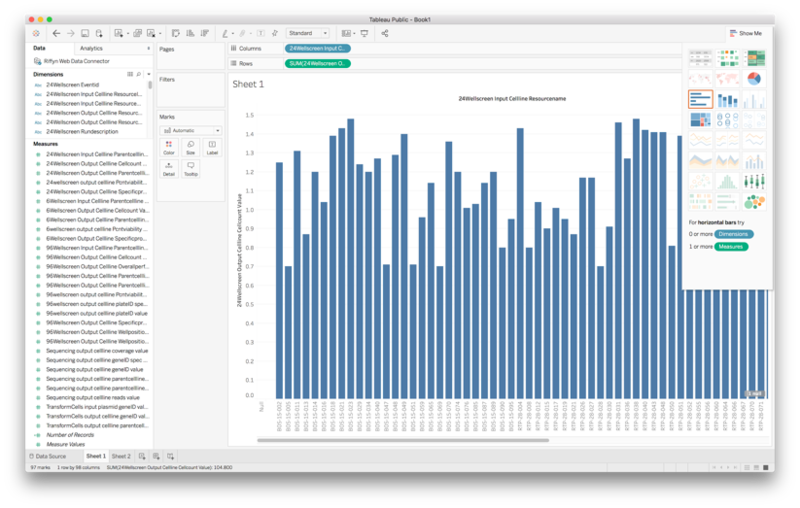 With the Riffyn WDC for Tableau, you can easily incorporate data from Riffyn into your visualizations and dashboards. With the Riffyn Web Data Connector for Tableau, you will be able to record your data in the lab and visualize your results in Tableau within minutes. Check out this 2 minute overview video to see it in action. The first step in using the Data Connector is the same as for any Riffyn process and experiment: you collect your experimental data and then Riffyn automatically integrates procedural information, metadata, and results data across your entire experimental process, creating a comprehensive data table ready for visualization and analysis. This data table can be downloaded as a .csv file for import into any statistical analysis platform. The next step is to utilize the new Riffyn Web Data Connector for Tableau. Instead of downloading the file, you enter your experiment ID into the Data Connector and the full data set is pulled directly into Tableau for visualization and analysis. You’ll have full control over what data you want to import — individual experiments or select groups of experiments. With Tableau visualizations, you can easily keep your team up-to-date on progress and highlight successful discoveries. You can create dashboards to track progress, and new data can be added quickly so that everyone has the freshest data. Data can be joined, filtered, and cleaned to create visually astute dashboards and analyses. The Riffyn Web Data Connector for Tableau runs within Riffyn’s secure environment. All Enterprise tier users can use the included web data connector. You can access the Riffyn Web Data Connector at http://ext.riffyn.com/tableau/RiffynWDC.html. For step-by-step instructions on how to use the Riffyn Web Data Connector for Tableau, check out this article in our help center. Need more help using Riffyn tools? Give us a shout at hello@riffyn.com. As always, you can also visit our help center at help.riffyn.com for more information.